SISTER ALICE MARIE QUINN, “our fearless leader, inspiring us for 40 years,” said Sr. Jo-Anne Laviolette, chair of Meals on Wheels. Word of the death of Sister Alice Marie Quinn, founder 40 years ago and executive director until this week of St. Vincent Meals on Wheels, came just as the Chronicle went to press. Her health had been in decline, and she died of natural causes. Mass and burial were on June 28. The day before Sister Alice Marie died, Daryl Twerdahl was appointed interim executive director. The Hancock Park resident will continue to maintain her role in development while she assumes her new responsibilities for the Daughters of Charity mission. She follows in the footsteps of Sister Alice Marie, who “has been our fearless leader, inspiring us for the last 40 years with her passionate vision and undying compassion for those we serve,” said Sister Jo-Anne Laviolette, Meals on Wheels Chair. 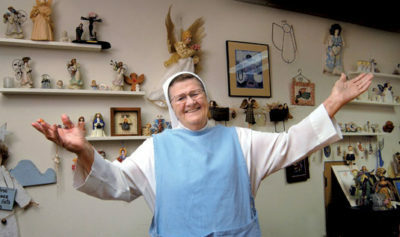 The Chronicle will have more on Sister Alice Marie next month, but there is a comprehensive obituary available now at stvincentmow.org. Anticipating Sister Alice Marie’s passing, the Daughters of Charity, guided by Sister Marjory Ann Baez, president of the Daughters of Charity Corporate Board, appointed Twerdahl to be Sister Alice Marie’s interim replacement. Twerdahl, who started her involvement with Meals on Wheels decades ago as a volunteer, is a former president of St. Vincent’s Cuisine à Roulettes. She knows well the leaders and goals of all the Meals on Wheels entities, including the Meals on Wheels Advisory Board and the St. Vincent Senior Citizen Nutrition Board.